We LOVE sound. Whether you either fill one room with sound or your immerse your home with seamless audio we can’t wait to help. From portable wireless speakers from SONOS, to surround sound from RICHTER, PSB, NAD and more, nothing soothes the soul better than the universal language of music! Sound Solutions and Electrical have been supplying and installing audio into homes throughout the East Coast of NSW for over thirteen years. Using quality brands like NAD, PSB, Samsung, Denon and more to complete our projects, you are guaranteed delivery of Hi – Quality Audio. We also use Herma projection screens with In Focus or Sony projectors to amaze your visual sensors. 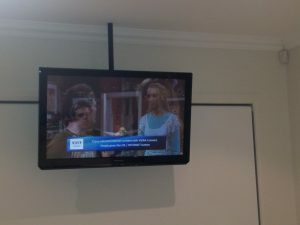 Watching a 22” LED TV or a 120” 3D projector screen we will accommodate you.